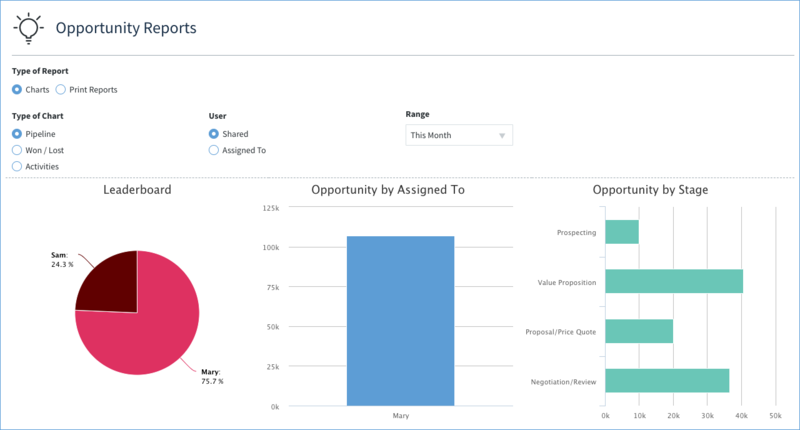 A graphical overview of your sales opportunities still in the pipline. The first of the three chart sections deals with opportunities still in the pipeline. 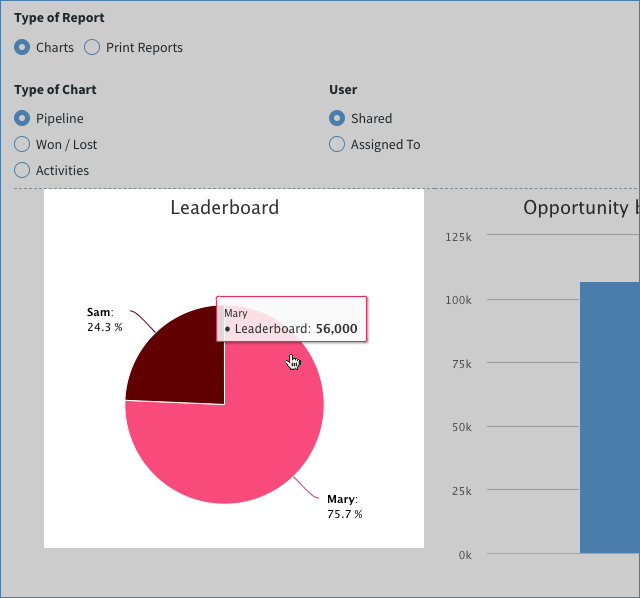 This information is displayed based on the user and date filters you set on the screen (see Intro to Opportunities Charts & Reports for details). There are three charts in this section, each of which are detailed below. The Method users who are assigned to opportunities in the given date range that have been closed as Won. If a user has none, they are omitted from the chart. The percentage of the total won opportunities for each user. Hovering over each section of the pie chart displays the total dollar amount for that specific user. In the above example, Mary is responsible for $56,000 of the revenue, accounting for 75.7% of the total revenue earned from opportunities that have been won. This shows Mary has three closed won opportunities. Users with open opportunities in the pipeline for the given date range. Users with no opportunities in the date range will not show. The total pipeline amount of each user's combined opportunities for the date range. Hovering over each bar displays the dollar amount. In the above example, all the opportunities Sam is assigned to has a cumulative pipeline amount of $46,488. 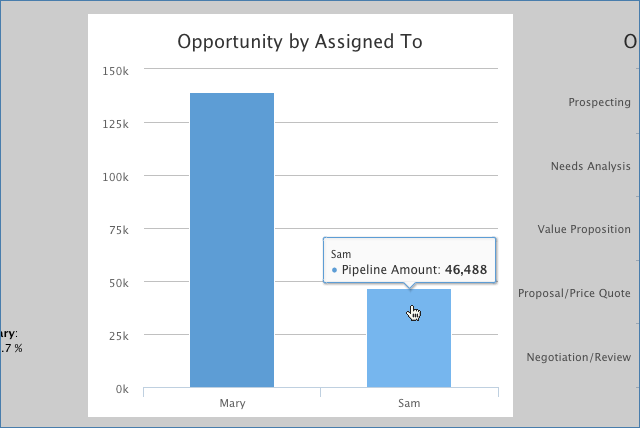 This shows Sam has six opportunities, with a cumulative pipeline value of $46,488. The opportunity stages correlating to each open opportunity in the given date range. Closed won and closed lost are omitted from this chart, as well as any stages not in any opportunity. The total pipeline amount of all opportunities in each stage. 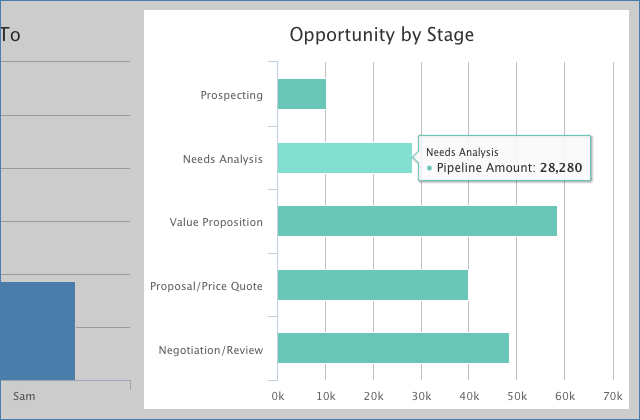 In the above example, the total pipeline amount for opportunities in the Needs Analysis stage is $28,280. The opportunities are ordered chronologically by close date in the list. This shows there are two opportunities in the Needs Analysis stage for a total of $28,280.